Periyar Tiger Reserve, Thekkady, is an example of nature’s bounty, with great scenic charm, rich bio diversity and providing veritable visitor satisfaction. 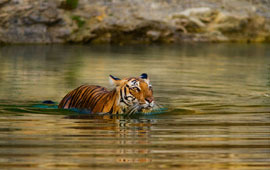 Sprawled over an area of 925 Sq .km., Periyar is one of the 27 tiger reserves in India. Zealously guarded and efficiently managed reserve is a repository of rare, endemic and endangered flora and fauna and forms the major watershed of two important rivers of Kerala, the Periyar and Pamba. Community Based Eco-Tourism People oriented and park centered community based ecotourism is the hallmark of Periyar Tiger Reserve. These programmes are conducted by local people responsible for the surveillance of the vulnerable parts of the reserve. By taking tourists along, they are involved in the conservation of the forests of Periyar and some valuable revenue is generated for community welfare. People who once made a living by illegal operations in the forests have since become forest protectors and earn their livelihood through these programmes. Hence, as a visitor, when you join them in any of these programmes,you are directly contributing towards forest conservation and community welfare.